Many people begin raising organic chickens to help them achieve a simpler, healthier life for their families. They want fresh eggs and chicken meat without the added antibiotics, steroids, and other additives that often accompany the store bought meat and eggs that you find in the market today. If this sounds like you, then you can go as deep into raising organic chickens as you want. By simply raising your own birds in your backyard, letting them free range, eat on your grass, and then supplementing that with off the shelf chicken feed from your local feed store, you can achieve a much healthier and happier bird. Although this may not be truly organic. 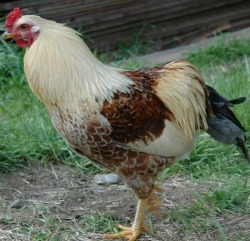 In a lot of ways it is up to you to determine what constitutes raising organic chickens. According to a study conducted by the USDA in 2006, "Conventional broiler and egg systems mostly use confined, high-density, mechanized housing. Unlike organic poultry, conventional poultry do not have access to outdoors or natural light" (2006,Oberholtzher, Greene, and Lopez). What this means is that we are eating meat and eggs from birds that are raised in an overcrowded environment and that don't even see the light of day. How healthy would we be if we were caged in a confined space from birth and never allowed outside. When you compound the situation by giving drugs to prevent chicken diseases, due to their stressful environment, you are creating a recipe for unhealthy chickens. You now understand why even partly going the organic route is healthier for the birds and in turn healthier for us, the consumer of meat and eggs, but if you want to go a step further and sell organic chicken products you will get into amore gray area, because there is not a universal standard for raising organic chickens. A great help when it comes to free-ranging your birds and keeping them safe could be a chicken tractor. If you have a small flock, it could be a very good solution for you. You can move these coops around every day and give your birds new grass to scratch, new bugs to feed on, and different nutrients, while also keeping the piece of mind that your flock will remain safe from dogs, foxes, coyotes, and many other predators that may be trying to have chicken for dinner. What is true "organic" when it comes to Raising Organic Chickens? There are several factors that may play into what organic standards that you have to follow when raising organic chickens to sell for meat or egg production. If you are selling less than 5000 dollars worth of product each year you can basically follow the simple organic solutions and be honest. When you are selling more than that per year you must be certified by state or private organizations under the uniform standards that were set up by the USDA. These standards in action have a tendency to vary slightly from organization to organization and from state to state. 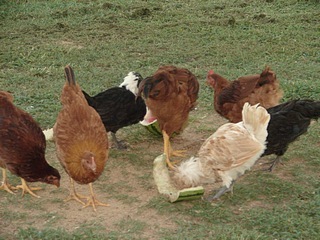 Poultry or poultry products must come from chickens that have been under organic management from the second day of life. If you cannot verify this you are not raising organic chickens. All feed, except minerals and vitamins, must be organically produced. Non-synthetic vitamins are preferred, but synthetic sources are allowed if non-synthetics are not available. Animal byproducts from mammals and poultry, such as meatand bone meal, may not be included in rations. Fishmeal and crabmeal are not permitted, because of the difficulty of determining if they were organically produced. Synthetic amino acids are not permitted. Non-synthetic but non-agriculturalproducts such as oyster shell and diatomaceous earth are permitted provided they comply with the Federal Food, Drug, and Cosmetic Act. The handling of feed ingredients must comply with organic requirements. Some people may buy organic feed from mill's or grow their own ingredients for feed, but organic guidelines must be followed with either choice. Physical alterations such as beak trimming and toe trimming are permitted to promote the welfare of the animal or flock. These are still discouraged and would be handled on a case by case basis. Living conditions must be established and maintained to "accommodate the health and natural behavior of animals, including access the outdoors, shade, shelter, exercise areas, fresh air, and direct sunlight." Continuous confinement in cages is not permitted, but temporary confinement is allowed if adequately justified. Health care: When raising organic chickens measures must include preventive practices such as good nutrition, sanitation, healthy living conditions, and vaccinations. Antibiotics are not permitted. Synthetic parasiticides including coccidiostats are not permitted. Although some natural alternative products are allowed, health problems must be controlled primarily through good management. Birds who do become sick cannot be withheld from medical treatment just to preserve their organic status. They shouldbe medicated and then sold into the conventional marketplace. Personally, I'm more of the belief that I'm doing all that I can do to provide good egg-laying birds having my chickens free range and supplementing that with regular chicken feed. In the future though, I do think that I want to move more toward organic. Considering that I currently try to take care of my birds through preventative management, as is suggested, and stay away from drugs (so far, you never know what one could catch), the only major thing left is what my chickens eat. In the coming months I'm going to check out many different organic feeds and then report on how they went over with the flock as well as take into account availability and price. I'll give you guys a full report on my findings. Recently Vicky from Illinois asked if there was an alternative to antibiotics when raising organic chickens. Her question was: I have a small flock of five hens. One of them got sick with a respiratory disease and the vet is having me give the whole flock tetracycline. I know I can't eat their eggs for 3-4 weeks after this. Is there an alternative to antibiotics? I was wanting to raise the chickens organically. I'm sure their are things that pure organic growers try, but I haven't heard of them. According to the organic standards, once the birds are given antibiotics they no longer meet the organic standard, but you also cannot with hold treatment just to retain this status. The safest thing to do in this situation unfortunately may be to listen to the vet and go ahead with the antibiotic. As an organic gardener and poultry keeper, I use Grapefruit Seed Extract, which was discovered in the 1970s when a researcher noticed that the grapefruit seeds did not rot in his compost heap. He went on from this observation and came up with this very effective treatment, which I believe is now the only available solution to deal with the hospital acquired superbugs such as MRSA. Grapefruit extract is great and olive leaf, too. 1) Make sure chickens live in the healthiest environment and have access to fresh life greens. 2) That water is clean and food sources are kept free fom old and rodents. 3) Chickens need fresh air and exposure to sunlight daily. 4) Supplementing their diet with vitamins during times of stress, ie; extreme heat or cold, shipping, injury or disease, can help boost the immune system to fight off bacteria, virus, or other physical weakness. If you are raising strictly organic chickens, you should check the requirements for organic vitamins.